This box reminds me of my childhood. In elementary school, my teacher would set a decorated box on her desk so we could fill it with Valentine's for our classmates. Each student in the classroom would give everyone a Valentine's card. Sometimes they were homemade cards, but the ones I loved the most were the store-bought shaped cards that were punched out of a sheet of card stock. Once signed, they were put in thin white envelopes and a name would be written on the envelope before it was "mailed" in the classroom box. It was fun time for each one of us. I still have the Valentine's card that my first grade teacher made for me. She made one for each of her students. It was a velvety red paper cut into a heart shape. She glued it onto a white paper doily and glued her picture on the front. It made each of us feel so special. I don't know if school children still create and give Valentine's. Do you know? If not, it's a sad thing that they don't have the opportunity to experience such sweetheart fun! Do you remember making and giving Valentine's as a child? Do tell! Oh La Tea Dah. I sure do remember Valentine's Day in elementary school. Just wrote a column about my memories for a weekly newspaper! Like your teacher, mine made us decorate a huge box with a hle cut into the top. Into it went all the Valentine's and on the special day, she distributed all the cards to each student. It was wildly exciting! Oh yes! They still do or at least my grands are looking forward to it having made out all their cards for their friends. They are much looking forward to their Valentine Parties today. Only one box for the entire class? We each made our own and it hung on the back of our chair or the shoe boxes were lined up on the shelves below the windows. Happy memories. Your first grade teacher sounds like such a sweetheart. I do, I do! It was so fun to get my little box of Valentine's and write everyone's name on them. I have similar memories. When I was reading at the local elementary school last year they said they would not celebrate Valentine's and I was so sad. Today when I was driving home I saw school children walking home and one was carrying a Valentine box all decorated. It just made my heart so happy to see that. 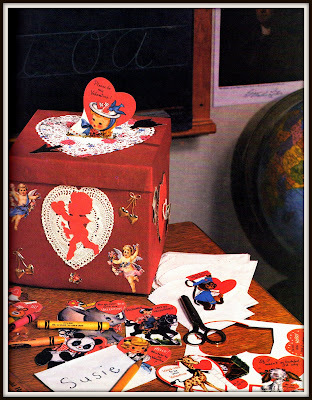 I have sweet memories of Valentine boxes at school. Yesterday afternoon I left my dear, little mother's home just in time to wait for the school bus that was dropping off the happiest little girl. Her arms were loaded - she had a well-decoratated Valentine box and a few other things in her arms. And on her face - the biggest smile! It brought back a lot of happy memories.